Play the world's most famous balance of power strategy game. Avalon Hill's Diplomacy is a turn-based game of political skill and cunning negitiation for up to 7 players. The game is set at the beginning of the 20th century when the great powers were all trying to exert their influence on the map of Europe. 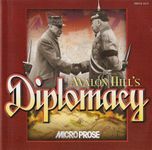 Avalon Hill's Diplomacy recreates that precarious time, on the verge of one of the most earth-shatering events in modern history: the First World War.